Unlike most people, Randall Moss dreams of being a badass murderer. He has made a reputation as a loud arrogant boaster and small-minded criminal, but he won’t stay this way for long. After being contracted by a Mexican drug cartel to assassinate Thomas Reed, a businessman, and Randall’s personal intent of robbing the man, he now has a crime planned. As soon as the two meet in a hail of gunfire that kills Thomas Reed and his wife, the criminals leave with what they came for. However, things are not as easy as they imagined because a security camera has recorded everything, leading to a hot pursuit of the group by the authorities. The truth will set him free, or so Chic Sparks thought. The clinical psychologist and part-time investigator was convinced by his red-headed girlfriend to pursue a notorious crime boss named Ken Renfroe. But he didn’t expect to be caught in a dangerous entanglement of drugs, cartel wars, and a money laundering operation. He eased himself into the dark world of criminals, but can he accomplish his mission and get out from it alive? Time is running out, so is Chic’s chance of survival. "A tale that delivers equally enthralling good and bad guys; readers should welcome Chic's subsequent forays into dangerous territory to thwart lawbreakers." "Sturdy mystery and rousing gunfights in a sequel that transcends its predecessor." 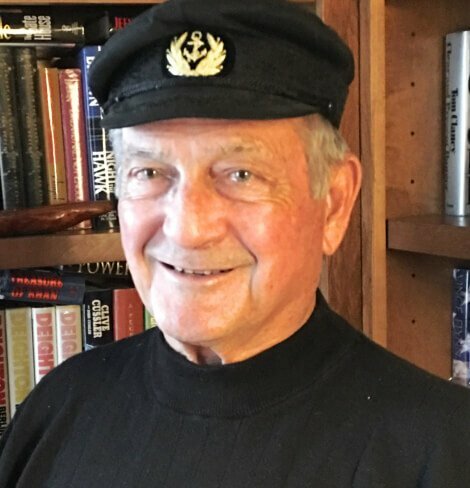 Kenneth L. Funderburk has practiced law for more than fifty years and is also a passionate artist. He graduated with a bachelor’s degree from Samford University, which was then called Howard College. He also attended graduate school at Mississippi State and received a juris doctor degree from the University of Alabama. He is affiliated with the Alabama State Bar, the United States District Court for the Middle District of Alabama, the Unites States Court of Appeals for the Eleventh Circuit, and the United States Supreme Court. He was once a bar commissioner and a president of the Russell County Bar Association. 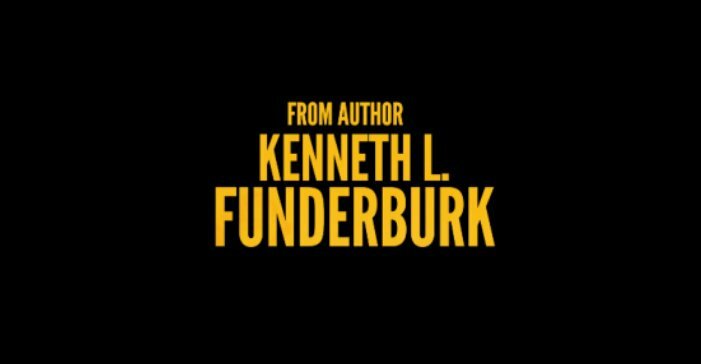 Kenneth L. Funderburk is doing private practice at Funderburk and Lane. He is also serving as a county attorney in Russell County, Alabama. 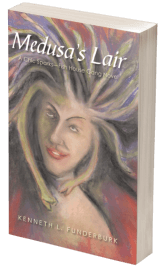 He has written two books—The Fish House Gang and Medusa’s Lair. 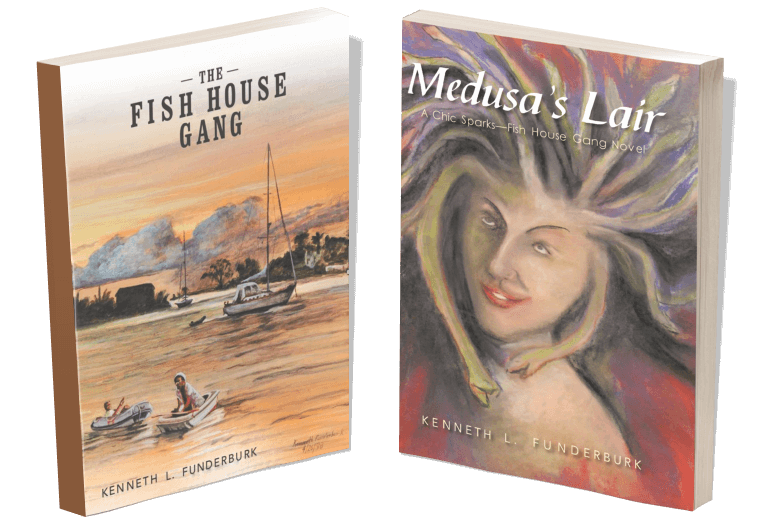 Many of the scenes in the The Fish House Gang are based on Kenneth’s observations as he sailed, in his forty-feet Amel Ketch named Amedee, over the entire Caribbean Basin and the Mosquito Coast of Yucatan and Honduras. A murky, pink twilight bathed the men in an eerie glow, which would leave any onlooker with a palpable sense of being in the presence of evil. And so it was that evil became incarnate in this group of common thugs. Randall Moss came upon the idea of robbing a man he knew who had plenty of cash on hand, but he needed some help. . . . He had quickly gathered six of his friends and acquaintances, including his father, Matt Moss, all of whom were now in his backyard drinking beer and plotting a quick military operation to relieve Thomas Reed of the money stored in his safe. Randall had worked for Thomas at one of his used car lots, which was more of a front for drug trafficking than for car sales. Randall worked long enough with Thomas to be able to identify his Mexican contacts. Randall kept his eyes and ears open enough to detect a pattern when Thomas would be flushed with cash. He determined that Thomas was part of the Mexican drug cartel and believed Thomas was skimming money from the Mexicans. Randall figured that Thomas’s friends actually put the contract on him for stealing money or not paying for product he had purchased. The Mexicans, of course, had other motives. This wasn’t information Randall planned to disclose to his group of thugs. Neither did he disclose the robbery to his employers who were paying him the $25,000 up front. “The assassins passed by them the first time. They came back in an easterly direction and finally spotted them. They could see the boat but not Chic and Danny. The assassins idled in the area with their bow pointed toward the shore . . . The assassins decided to start firing from their present position. They let loose with a volley of twenty to twenty-five shots before they let up. They managed to shoot a few holes in the boat, but the engine protected them from any injury . . .
Miguel was behind the wheel, and Lucas was the shooter. Miguel gave full power headed toward Chic and Danny, and Lucas began firing with his rifle as they charged. At this point, it was too pistols versus one unsteady rifle. Miguel was headed directly at Chic’s boat. When they got within a hundred feet of Chic and Danny, they seized their opportunity. They were able to quickly take Lucas out with a couple of body shots, using the hollow- head bullets. Miguel got in closer and made a hard right turn, swinging the boat sideways to Chic’s boat. At this point, Miguel was clearly in range and exposed. A pleasant day to you! Feel free to share your stories to me by leaving me a message.